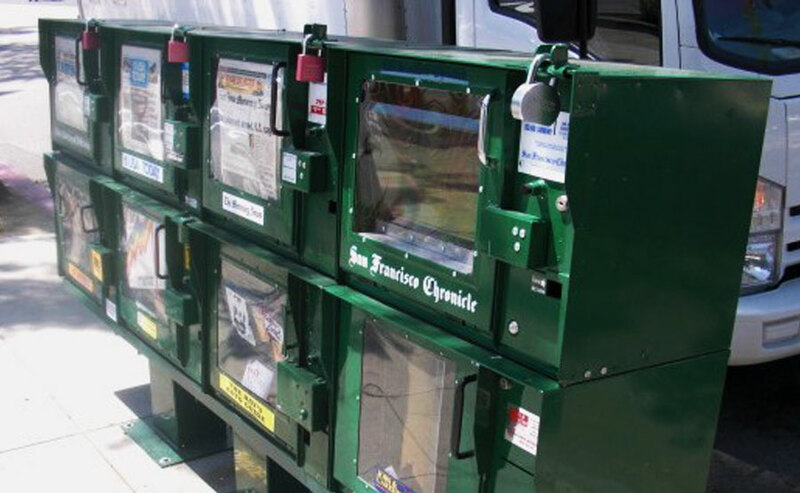 In 1992, San francisco Beautiful established a taskforce that included publishers, community groups, DPW, and the City Attorneys to forge a plan that would eliminate the clutter and hazards of unmitigated newsracks while preserving the publications right to sell papers. The City instituted a pilot program which resulted in the development of a pedestal mounted newsrack. The response was positive and the Public Works Code was amended to create pedestal mounted newsrack zones. Due to the decline in printed news circulation, these racks have become a contributing factor to cluttering and blighting our sidewalks. In 2012, SF Beautiful conducted an informal survey of the Market Street newsracks and found that 40% had no newspapers in them at all. Those that did, often were less than 25% occupied. The vacancies are often filled with trash and graffiti. Further, the street-side of the racks serve as illuminated street-level advertising, negatively impacting the corridor. SF Beautiful advocates for the re-negotiation of the contract to reduce total number of the newsrack zones and to conduct a study of off-Market corridors that could be enhanced with the addition of pedestal mounted newsracks.